Keeping your pet’s oral health up to snuff is important. 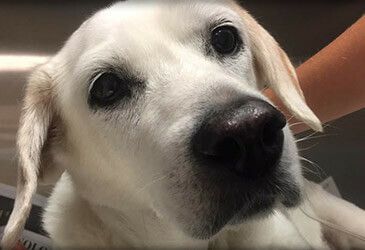 Poor oral hygiene with subsequent tartar, gingivitis, periodontal disease, and resorptive enamel lesions (in dogs) can all lead to a painful mouth and is a leading cause of premature aging in our pets. Periodontal disease can serve as a source of infection that enters the blood stream and affects overall kidney, liver, lung, and heart health. Together we can create a program that suits your lifestyle and meets the needs of your pet. Pet Care Veterinary Hospital offers advanced dental care to pets. All dental cleanings performed include digital dental X-rays and tooth-by-tooth assessments by our doctors. Pets anesthetized for dental procedures are constantly monitored by a doctor and a specially trained licensed veterinary technician. Your pet’s comfort and safety is our primary concern. We offer safe and effective pain management, including local anesthesia to numb your pet’s mouth if necessary. Should your pet have damaged or diseased teeth, please know that extraction is not your only option.